Hi everyone! Hope you had a great weekend! My husband and I spent a lot of it getting things ready for our house. Hard to believe that we move in two weeks! So many things we still have to do! We also decided to get a membership to Costco! I guess we are going to be buying a lot in bulk! 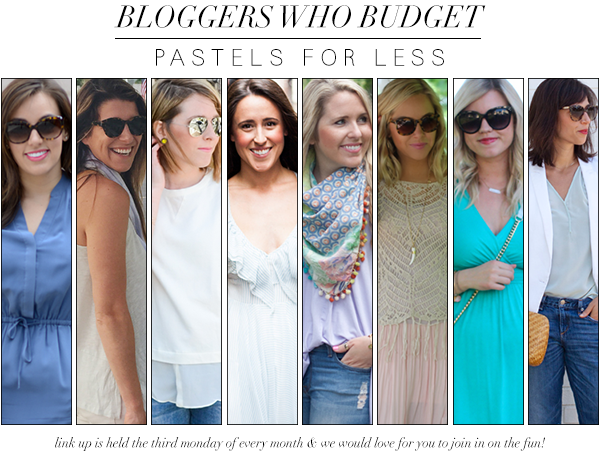 Our bloggers who budget theme is pastels this month! I got this skirt earlier this spring from Forever 21. It has been fun to wear and I just love this soft pink color! Love this neutral look, so pretty. Loving your skirt! And welcome to Costco where you will need everything in super sized form, so much fun! Beautiful textures! I love the soft hues in your summer look. This is so so pretty and feminine! I love how light and airy it looks! I love that skirt! I may have to see if they have a similar current version! The pastel look is great on you! LOVE that skirt. Perfect for everything! In style! I am loving your blog! Looking lovely, what a cute crochet top. this is such a nice combination, you look great! You look beautiful! That skirt and top go well together! Gorgeous dress, love the detailing! The link up is also a great concept! How exciting that you're moving into your home in 2 weeks! This outfit is so pretty, love the soft colors and the textures. This is one of the most gorgeous pastel monochromatic looks I have ever seen. Both the maxi skirt and sweater are stunning!